Description: Southbound freight rounds the big turn leading into CP Vaughan Intermodal yard. Description: Pacing CP 8889 east between Brooten and Belgrade. Description: Q410-13 with a bit of color. Description: Waiting to be shopped. Description: CP train #183 swings past Dakota MN on a cloudy Saturday morning. Title: Well, this was unexpected! Description: CP power resting on a bridge. Title: Norfolk Southern south-bound manifest with Canadian Pacific power! 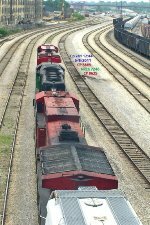 Description: West Chester, Ohio Norfolk Southern Dayton District MP 240. Description: NS #295 (Chicago-Jacksonville) usually warrants a pair of NS Dash-9's making this CPRail duo extremely rare! Description: Southbound at mp 752 approaching NS Buffalo Line.